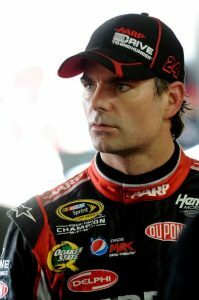 Jeff Gordon is an American former professional stock car racing driver, currently an announcer for Fox NASCAR, and a top executive for Hendrick Motorsports. He won his first of many Winston Cup Series Championships in 1995. Born Jeffery Michael Gordon on August 4, 1971 in Vallejo, California, to parents Carol Ann Bickford and William Grinnell Gordon, he was raised in Pittsboro, Indiana. He began his racing career at the age of 5, racing quarter midgets. He attended Tri-West Hendricks High School in Lizton, Indiana and graduated in 1989. He has been married to Ingrid Vandebosch since November 7, 2006. They have two children Ella Sofia and Leo Benjamin. He was previously married to Brooke Sealey. *He was born on August 4, 1971 in Vallejo, California, USA. *He started racing with Go-Carts and Sprint Cars. *He won his first Daytona 500 in 1997. *He is the first driver to reach $100 million in career earnings in the Cup series. *People Magazine named him one of the top 50 Most Beautiful People in the World in 1997. *His net worth was estimated to be $155 million in 2004. *He currently resides in Charlotte, North Carolina. *Follow him on Twitter, Google+, YouTube, Facebook and Instagram.